UCLA had five players score in double figures and collected 13 offensive rebounds to beat the Wildcats 77-72 and snap UA's 21-game homecourt winning streak today at McKale Center. 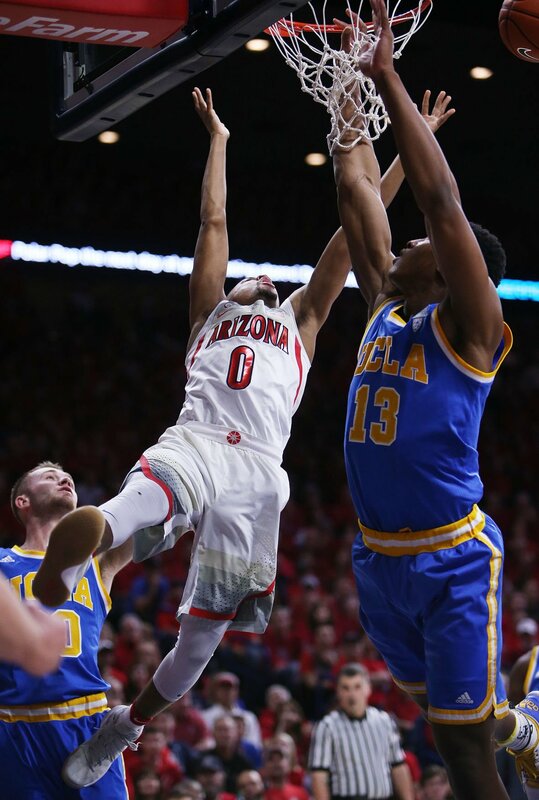 The loss pushed Arizona (26-4, 15-2) back into a first-place tie in the Pac-12 and made a slightly somber Senior Day for UA guard Kadeem Allen, who badly missed a final 3-point try with eight seconds left that could have tied the game at 75. The Wildcats had never before lost in a Senior Day under coach Sean Miller. The Bruins (26-3, 13-3) outrebounded UA 34-29 overall and scored 19 second-chance points on 13 offensive rebounds, collecting nine offensive rebounds in the second half when they overcame a four-point UA halftime lead. Allonzo Trier led UA with a career-high 28 points but the Wildcats made just 4 of 18 3-pointers after making 11 of 20 on Thursday against USC. The loss meant UA went back into a first-place tie with Oregon at 15-2 in the Pac-12, after the Ducks beat Stanford earlier Saturday. Oregon holds the tiebreaker for the No. 1 seed in the Pac-12 tournament based on their Feb. 4 win over Arizona. Both schools have only games with their instate rivals remaining. Up 43-39 at halftime, Arizona went ahead by up to seven points early after halftime but the stats for both teams were remarkably similar through the first seven minutes of the second half: Both were shooting about 48 percent from the field, but less than 30 percent from 3-point range, and while Arizona outrebounded UCLA overall 24-20, the Bruins had converted six offensive rebounds into 10 second-chance points (six more than UA had). UCLA’s Thomas Welsh scored six unanswered points to take their first lead of the second half, 54-53, with 12:52 left. The Bruins then parlayed that into a 19-4 overall run that gave them a 67-57 lead with 6:47 left, when UA coach Sean Miller called his final timeout. The Bruins had converted nine offensive rebounds into 17 second-chance points at that point, including a rebound basket from Holiday after Ball missed a 3-pointer. UCLA kept the lead from there, though a 3-pointer from Trier cut it to 75-70 entering the final minute and Lauri Markkanen hit a pair of free throws to cut it to 75-72 with 29 seconds left. But even though Aaron Holiday missed the front end of a one-on-one with 19 seconds left, giving the Wildcats to tie it with a 3-pointer, Allen then missed his 3-pointer and two free throws by Bryce Alford gave UCLA the final five-point margin. Allen is still nursing a dislocated pinkie finger on his shooting hand and was seen grabbing at it on several occasions during the game. In the first half, Trier had 16 points and Jackson-Cartwright made some late-half heroics to lead Arizona to a 43-39 halftime lead. UCLA led by up to seven points early before a rowdy McKale crowd that was on its feet for much of the half, but Jackson-Cartwright hit a corner 3 to cut the Bruins’ lead to 38-36 with 2:19 left. Keanu Pinder's block of a layup by UCLA's Isaac Hamilton later kept it tied at 39 before Jackson-Cartwright hit two free throws off a foul by Lonzo Ball. Jackson-Cartwright later took a charge by UCLA's Aaron Holiday and, on UA's final possession of the half, drove inside to hit an 8-footer in the lane for the Wildcats' four-point halftime lead. Jackson-Cartwright finished with nine points. UCLA finished the half shooting 43.8 percent overall but made just 4 of 15 3-pointers while UA shot 48.3 percent and outrebounded UCLA 21-15 overall. The Bruins did not score a field goal for the final 2:55 of the first half. The Bruins were led by point guard Lonzo Ball, who had nine points, three rebounds and four assists to two turnovers. Trier had 12 points already with 7:32 left in the first half, but the rest of the Wildcats’ offense was struggling at that point – and UCLA hit two straight threes after making just one of their first seven. The UCLA 3s gave them leads to 24-19 (on one by Ball) and 29-22 (by Bryce Alford), though Trier had a three-point play cut UCLA’s lead to 29-24. Alford hit a 25-foot bomb with 6:49 left that put UCLA ahead 32-25 and then Ball blocked a shot under the basket from Lauri Markkanen, who later hit a 10-foot fadeaway to make it 32-27 with six minutes to go. Arizona guard Kadeem Allen picked up his third foul with 4:20 to go when he swiped UCLA's Bryce Alford beyond the 3-point arc. UA coach Sean Miller, who said Thursday he would tweak his lineup to whatever he felt would give the Wildcats the best chance to start well, went with Rawle Alkins and Trier on the wings, leaving Allen alone at point guard while Jackson-Cartwright and Kobi Simmons came off the bench. UA had a number of key recruits watching the game including 2017 five-star talents Brian Bowen of Michigan and Trevon Duval of Delaware. Duval is taking an official visit to UA while Bowen is visiting unofficially (unpaid) because he has already taken an official visit to Tucson. Get a recap of news from Arizona's game against UCLA.